The Scarlett 8i6 is an 8 in / 6 out audio interface with outstanding sonic performance and flexibility at a truly affordable price. Part of Focusrite’s new range of USB audio interfaces, the Scarlett 8i6 is designed to make home studio recording and mixing easy without sacrificing audio quality. Twenty-five years of mic pre excellence form the foundation of this new interface, with two award-winning Focusrite preamps. Combined with a host of additional I/O options, the Scarlett 8i6 helps you get the tracks you want without having to constantly re-patch your studio. Alongside the two high-quality mic preamps, two additional analogue inputs, four analogue outputs, S/PDIF and MIDI open the door to true multi-track recording. Two Hi-Z instrument inputs let you plug straight in without the need to buy additional DI boxes, and two virtual Loopback inputs are also available for routing digital audio between software applications - ideal for capturing online audio. Scarlett 8i6 comes with all of the additional tools needed to start making music straight away. Scarlett VST/AU/RTAS Plug-in Suite comes in the box, adding Focusrite compression, reverb, gating and EQ to your recording system. 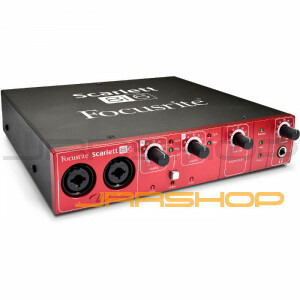 Two high-quality award-winning Focusrite preamps: The best sounding interface in its class. Focusrite's 25-year legacy forms the foundation of this new interface, with two award-winning preamps. High-quality 24-bit/96kHz USB interface: Features professional conversion and jitter reduction technology, guaranteeing pristine audio quality and reliable synchronization. Total I/O count of 8 inputs and 6 outputs: A host of I/O options are provided*, including a unique Loopback facility for routing audio between software applications via Scarlett MixControl. Scarlett MixControl ultra-low-latency DSP mixer/router: Provides an 18 x 6 DSP mixer with excellent routing flexibility, intuitive one-click configurations, and lower than 1.4ms latency (less than the time it takes sound to travel two feet through air!). Scarlett VST/AU/RTAS Plug-in Suite, for use in the mix: Upgrade your standard sequencer effects and bring a touch of class to your session with Focusrite’s Scarlett compression, reverb, gating and EQ. Xcite+ Software Bundle: Featuring a host of royalty-free loops and samples, a full-fledged soft-synth and Ableton Live Lite 8, providing an affordable upgrade path to Ableton Live. Two Hi-Z instrument inputs: No need for a separate DI. The first two channels feature high-gain instrument inputs. Dedicated front-panel headphone bus: Providing a fully customised monitor mix, with tactile level control available on the front panel. Monitor levels are always within reach: A front panel volume dial provides immediate control over the main stereo outputs. Switchable phantom power: Across both mic pre inputs, globally switchable direct from the front fascia. 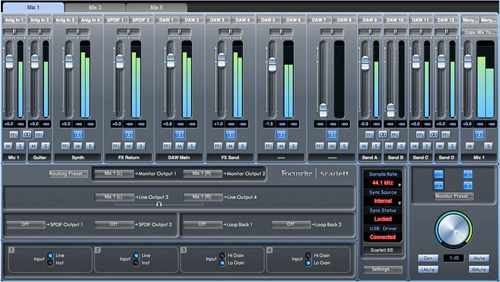 Software PFL: Allows the mix engineer to easily monitor a single mixer channel or complete mix.